“The Disposition Matrix” sounds like a dystopian science fiction novel. And indeed it is, but unfortunately it’s being written by the American counter-terrorism bureaucracy, and rolled out as the blueprint for a future of state-sanctioned death squads. The Washington Post prints a riveting chapter of this story, a sequel to Obama’s notorious “kill list”. We discover the existence of a “next generation targeting list” (the aforementioned matrix), a spreadsheet of doom which will be used to keep track of all the undesirables now targeted for elimination by the CIA. The story expertly combines bureaucratic tedium with horrific violence, and it is full of bizarre and terrifying lines. “The database is designed to go beyond existing kill lists, mapping plans for the ‘disposition’ of suspects beyond the reach of American drones.” Drone assasination is now the first resort of the state. “‘We can’t possibly kill everyone who wants to harm us,’ a senior administration official said. ‘It’s a necessary part of what we do. '” Killing is ineffectual, which is why killing must remain our business forever. “Mitt Romney made it clear that he would continue the drone campaign. ‘We can’t kill our way out of this,’ he said, but added later that Obama was ‘right to up the usage’ of drone strikes and that he would do the same.” We can’t kill our way out of this, so we must keep killing. You must go on. You can’t go on. You’ll go on. “‘We had a disposition problem,’ said a former U.S. counterterrorism official involved in developing the matrix.” The problem was that there remained some people that the U.S. government was unable to kill. “The proposal, which would need White House approval, reflects the [CIA]’s transformation into a paramilitary force, and makes clear that it does not intend to dismantle its drone program and return to its pre-Sept. 11 focus on gathering intelligence.” This will be very different from the Tonton Macoutes. There will be no rustic straw hats and denim shirts this time. “The matrix was developed by the NCTC, under former director Michael Leiter, to augment those organizations’ separate but overlapping kill lists, officials said.” This is typical of the bloated, inefficient government bureaucracy. One day they’ll think to outsource the machinery of death entirely. “The approach also applies to the development of criteria for ‘signature strikes,’ which allow the CIA and JSOC to hit targets based on patterns of activity . . . even when the identities of those who would be killed is unclear.” Like Google’s search algorithm, the characteristics that will make you deserving of government assasination are obscure. “For an administration that is the first to embrace targeted killing on a wide scale, officials seem confident that they have devised an approach that is so bureaucratically, legally and morally sound that future administrations will follow suit.” Barack Obama truly deserved his Nobel peace prize after all; he inaugurated the most moral campaign of wide scale killing in history. “The number of targets on the lists isn’t fixed, officials said, but fluctuates based on adjustments to criteria. Officials defended the arrangement even while acknowledging an erosion in the caliber of operatives placed in the drones’ cross hairs.” Targeted killing used to be glamorous and sophisticated, but these days it’s a bore. All the good targets are already dead. “A senior aide to Panetta disputed this account, and said Panetta mentioned the shrinking target list during his trip to Islamabad but didn’t raise the prospect that drone strikes would end. Two former U.S. officials said the White House told Panetta to avoid even hinting at commitments the United States was not prepared to keep.” If we stop the killing, the terrorists will have won. If we say that we will stop the killing in the future, the terrorists will have won. If we hint that we might commit to stopping the killing in the future, the terrorists will have won. Many of the rich . . . have resigned themselves to barricading themselves into their fortresses, to be protected by unmanned drones and private military contractors. Guard labor . . . reappears in an even more malevolent form, as a lucky few are employed as enforcers and protectors for the rich. But this too, is an unstable equilibrium, for the same basic reason that buying off the masses is. So long as the immiserated hordes exist, there is the danger that it may one day become impossible to hold them at bay. Once mass labor has been rendered superfluous, a final solution lurks: the genocidal war of the rich against the poor. Until now, we have relied on the prison system to warehouse the unemployed and unemployable, but there just seem to be more and more of them. How long until someone like Pete Peterson demands, in the name of fiscal responsibility, that we begin liquidating these stocks of unproductive bodies? Fortunately, the disposition matrix has nothing to do with such fears. The targets of the lists are not surplus labor, after all, we are merely terrorists. In the debate between Alex Gourevitch on one side, and Chris Bertram and Jacobin contributing editor Max Ajl on the other, I’d put myself more on Bertram and Ajl’s side. Gourevitch’s essay was a bit too long on caricatures of environmentalism, and too short on critiques of the particular way in which development operates in capitalism. I do think, though, that Ajl’s opening is a bit misleading as to the substance of his argument. He ridicules Gourevitch’s call for “control and manipulation of nature” as “pure ideology”, and insists that “ecological problems are not resolvable through endless technofixes”. But the further control and manipulation of nature by means of technology is then precisely what he goes on to advocate. What separates the two positions is that while Gourevitch tends toward an uncritical conflation of “development” and “capitalist development”, Ajl outlines an explicitly ecological (though not necessarily anti-capitalist) path of development, involving things like high-speed rail networks and alternative energy systems. Ajl’s other important point is to separate the defense of advanced technological society from the praise of large scale, centralized industrialization. As Bertram notes in his post, there is a sort of stagist theory of history implicit in Gourevitch’s argument, in which poor countries must pass through the same kind of industrial development that characterized the imperial metropoles in the twentieth century. In fact, it is possible for poor regions to skip over some parts of the earlier history of industrialization entirely. Hence we see countries skipping the buildout of land line telephones in favor of cellular, and the same may happen with distributed solar power generation. Thus, while the specific criticisms Gourevitch makes (on Palestinian bicycle generators and the California energy crisis) are mostly on target, he is too quick to dismiss “federated, small-scale self-sufficient production communities” entirely. As Ajl notes, a red-green vision may reject retreating into some pre-industrial past, but it is also about something more than just generalizing current rich country ways of life to the whole world. I’m jumping into all this because it connects to my last post on 3-D printers and related small-scale fabrication technologies. * One of the appealing things about these technologies is that, as Juliet Schor notes in this post, they have the potential to make high-productivity but small scale production much more viable. This implies that an increasingly productive economy need not be identical with an increasingly centralized and hierarchical one. Which is not to say that big and complex infrastructural systems can be done away with entirely, only that they can be a less important part of our material culture. It may turn out that the industrial age was actually the apex of economic “bigness”, and that the post-industrial future will be both more decentralized and richer, a manifestation of what Ursula Leguin calls a “genuinely mature society” that employs advanced technology but has transcended the capitalist imperative to constantly grow and expand. In recent times, decentralization of the economy has been rhetorically associated with the libertarian right (even if, as Parameswaran argues, their project was actually a continuation of the control revolution). There is no reason, however, for the Left to respond by fetishizing bigness, which would be no better an answer than the the fetish for smallness that afflicts some of the environmentalists Gourevitch criticizes. As an aside, I should clarify that some of what I discussed in that post was speculative, and not meant to describe the current state of these technologies. In particular, I’m well aware that it’s not possible to manufacture anthrax (or, to be scientifically precise, the Bacillus anthracis bacterium) in one’s home. But there’s no reason to believe such things won’t eventually be possible. I wrote earlier this year (at Jacobin, the New Inquiry, and Al Jazeera), about the fight over laws like the Stop Online Piracy Act, which would have given the state broad and ambiguous powers to monitor and persecute alleged copyright infringers. The intellectual property lobby is currently in retreat on this front, but the general problem of intellectual property stifling progress has not abated. Aaron Swartz, who was the victim of one of the more ludicrous recent piracy busts, is still facing multiple felony counts. Apple and Google, meanwhile, now spend more money on patent purchases and lawsuits than they do on research and development. 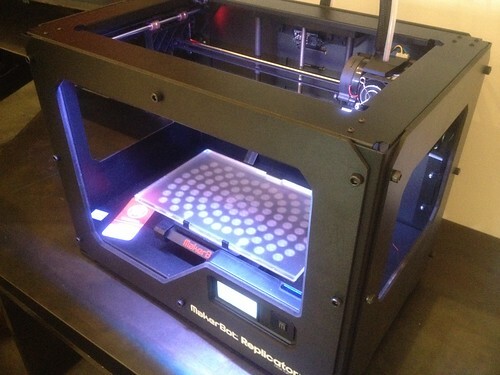 And the next front in the war over IP is likely to center on 3-D printing. In the last issue of Jacobin, Colin McSwiggen admonished designers to pay attention to the fact that they “make alienated labor possible”. The idea of “design” as separate from production is tied to the rise of large scale capitalist manufacturing, when skilled craftspeople were replaced with factory workers repetitively churning out copies from an original pattern. But the order McSwiggen critiques is one which will be undermined by the dissemination of micro-fabrication technology. This is where the intensification of the surveillance state, throughout the Bush and Obama administrations and under the rubric of the “war on terror”, becomes important. The post-9/11 security state has gradually rendered itself permanent and disconnected itself from its original justification. We will be told that our purchases and downloads must all be monitored in order to prevent evildoers from printing arsenals in their living rooms, and it will just so happen that this same authoritarian apparatus will be used to enforce copyright claims as well. Meanwhile, the military will of course proceed to use the new technologies to facilitate their pointless wars. Readers who are interested in a preview of this dystopia of outlaw fabricators trying to outrun the police are referred to Charles Stross’s novel, Rule 34. Update, 2 October 2012: Corrected a mistake in the data on the charitable contributions tax deduction. An earlier version referred to the wrong table from the Tax Policy Center. The American plutocracy’s habit of portraying itself as an oppressed minority has become a source of ongoing amusement, and Chrystia Freeland has the latest chapter of this comedy in the New Yorker. She presents a series of quotations and anecdotes that will be barf-inducing to anyone who hasn’t had their head pickled in Ayn Rand aphorisms. I particularly enjoyed the guy who compared Barack Obama’s treatment of the rich to the oppression of black Americans, and the guy who compared Wall Street supporters of the President to battered wives. It would, indeed, be nice if you had the choice. Obviously charitable donation is only equivalent to tax-funded government spending if you are indifferent to democratic accountability. So it’s not surprising to hear this kind of rhetoric out of the ultra-rich, who tend to be committed to an ideology of meritocracy that is fundamentally hostile to democracy. The less cautious apologists, like Bryan Caplan, will straightforwardly propose “relying less on democracy and more on private choice and free markets.” Left unsaid is that “choice” in the private market consists mostly of the choices of the people with the most money. This is why a class compromise over the welfare state is so elusive. It doesn’t matter whether the rich agree that they benefited from their society in the “you didn’t build that” sense, nor does it matter whether higher taxes on the rich and more spending on social programs and jobs will ultimately promote more economic growth. This is about power. Even those who piously declare their desire to “give back” to society insist on doing so only on their own terms. Traditionally, the socialist movement has emphasized the need to subject the investment decisions of capitalists to democratic accountability, but it’s just as important to talk about democratic control over social welfare spending. The choice we face is not really whether there will be a social safety net, the struggle is over whether we will have a democratic welfare state or a kind of private welfare state run according to the whims of rich philanthropists. The latter, even in the improbable event that it could replace public spending in terms of overall dollars, would be both undesirable as a matter of democratic principle, and a lot less likely to consist of the kind of universal, unconditional income support that is most consistent with individual freedom. A more specific policy point about this issue of “self-taxing” is that it highlights what an obscenity the tax deduction for charitable donations is. The Joint Committee On Taxation reports that this deduction (including both individual and corporate donations) cost the federal government $41.3 billion in 2012, and the cost is projected to rise to $54.7 billion by 2015. Data from the Tax Policy Center shows that over 95 percent of this benefit goes to the to 40 percent of the income distribution, and over a third of it goes to the top 1 percent. This data also shows that repealing the deduction would be equivalent to a 0.5 percent tax rate increase on the top 20 percent, and a 1 percent rate hike on the ultra-rich top 0.1 percent. It’s bad enough that this deduction encourages the transfer of social welfare functions from the state to the unaccountable non-profit sector. But a lot of “charitable” spending is of questionable social value anyway. Leon Cooperman, described in Friedland’s article as the “pope” of the whiny billionaire movement, recently gave $25 million to the Columbia Business School, which means that the government is subsidizing his efforts to help the reproduction of the capitalist managerial class. The Bill and Melinda Gates foundation, one of the largest charitable foundations in the country, is a major promoter of the neoliberal “education reform” movement that played a major role in the battle between Rahm Emanuel and the Chicago Teachers Union. And large chunks of charitable donations (including Mitt Romney’s) go to churches, which are more important as conservative ideological and political actors than they are as sources of aid. Leon Cooperman is both a signatory to the Warren Buffett/Bill Gates “Giving Pledge”, which commits him to giving the majority of his assets to philanthropic causes, and a passionate supporter of Mitt Romney. There is no contradiction there. Cooperman and Romney are both committed to the same principle: there’s nothing wrong with helping the needy, as long as only rich people have the right to decide when, whether, and how it gets done. You can look at people like Gates and Cooperman as the alternative to the decaying, narrowly rapacious capitalist class I described in this post. They aren’t altruists or class traitors, they’re just demonstrating their enlightened self interest as a ruling class, and a recognition that they need to dedicate some resources to collective projects that help perpetuate the society they dominate. But they’re still the class enemy, and they’ll remind you of that as soon as their power is seriously threatened.